NCAA tournament strike: The opening Thursday of March Madness is the perfect time for college basketball players to walk off the court. The opening Thursday of the NCAA tournament is the perfect time for college basketball players to walk off the court. Instead of a tipoff, college hoops players should hold a walk-off to start March Madness. It’s time for March Madness, that magical three-week stretch when all of college sports’ revenue streams converge. In 2010, the NCAA signed a 14-year, $10.8 billion deal with CBS and Turner to broadcast the tournament. The NCAA also earns money from ticket sales and concessions, while its TV partners give ample on-air callouts to advertisers—sorry, “NCAA Corporate Champions”—AT&T, Capital One, and Coca-Cola, all of whom line the organization’s pockets with more than $35 million per year. Florida coach Billy Donovan and Oregon’s Dana Altman among others earned contract bonuses when their teams made the NCAA tournament field. And even if you set aside Warren Buffett’s imaginary $1 billion bounty for a perfect bracket, there is still an enormous load of cash flying around in Vegas and in office pools across the country. William Friday, the former North Carolina president, recalls being yanked from one Knight Commission meeting and sworn to secrecy about what might happen if a certain team made the NCAA championship basketball game. “They were going to dress and go out on the floor,” Friday told me, “but refuse to play,” in a wildcat student strike. Skeptics doubted such a diabolical plot. These were college kids—unlikely to second-guess their coaches, let alone forfeit the dream of a championship. Still, it was unnerving to contemplate what hung on the consent of a few young volunteers: several hundred million dollars in television revenue, countless livelihoods, the NCAA budget, and subsidies for sports at more than 1,000 schools. Friday’s informants exhaled when the suspect team lost before the finals. Whether or not you believe this specific story, you’ve got to admit that it’s an ingenious ploy. The popcorn is popped, the commercials are queued up, and the best players in the college game refuse to take the floor. Take that, corporate champions! A walkout at the Final Four would get the world’s attention. An even better plan would be for players to go on strike as the first round of games gets set to begin on Thursday afternoon. 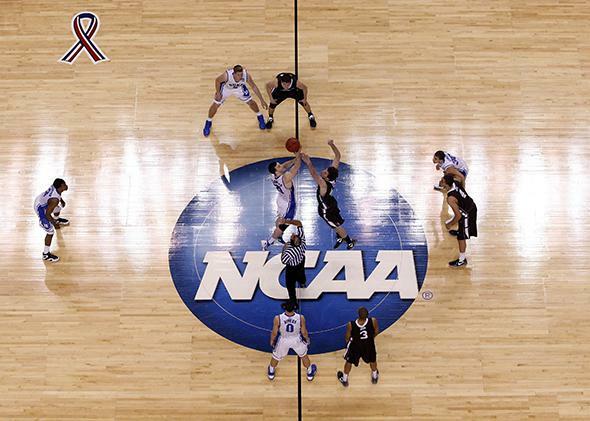 Even a simple, brief show of organized action—a two-minute-long delay before the opening tip, with players from both teams standing in a line across center court—would hijack the conversation about March Madness, redirecting attention from what’s happening on the floor to the NCAA’s unfair practices off the court. In 2012–2013, the NCAA distributed $188 million from its basketball fund to Division I conferences based on their performance in the tournament over a six-year period. This money, of course, is not earmarked for basketball players, or for any other college athletes. A school can use it to pay a coach’s contract bonus, or to build a new weight room, but it would be against NCAA rules to hand it out to the athletes who did the most to earn it. Law professor Marc Edelman suggested recently that a fair market wage for playing in the tournament might be $340,000 per player—that’s 45 percent of NCAA tournament broadcast revenues divided by 68 teams, with 15 players per team. Edelman also puts forward a $170,000-per-player-per-game plan that acknowledges that some teams advance further in the tournament than others. Neither of these formulas makes sense. Edelman fails to acknowledge that in pro sports, all the players (not just the ones who make the playoffs) collectively share a percentage (typically between 45 and 50 percent) of all the revenue generated by that sport. There is no dead-simple formula to figure out how college basketball’s cash should be distributed. But it stands to reason that all 351 Division I teams should benefit from the revenues reaped on college hoops’ biggest stage. If you took half of the NCAA’s average annual tournament broadcast revenue, divided it equally among those 351 teams, then divided it again to give an equal cut to 15 players per squad, you’d get around $73,000 per head. And that doesn’t even factor in things like ticket sales. The point is that there is a lot of money to go around, and it’s about time college basketball players got some of it. In the past year, there have been a few stirrings of activism from college athletes. Back in September, a handful of football players adorned themselves with the letters “APU”—All Players United—in a show of solidarity coordinated by the National College Players Association, an advocacy group run by ex-UCLA linebacker Ramogi Huma. “They came up with a way they felt comfortable to show unity,” said Huma. “This is an effort, this is a call for players of all sports, anyone who supports players’ pursuit of basic protections.” The next phase came in January, when Northwestern University football players took the first steps to form a union. The time is now right for a big collective action, something more akin to a giant leap than a baby step. A strike on the first big day of the NCAA tournament would certainly fit those parameters. Here’s how a strike might look. At 12:15 p.m. ET on Thursday, Ohio State and Dayton link arms as the cameras roll, refusing to acknowledge the referees. Twenty-five minutes later, the men of American University walk off the court before their game against Wisconsin—a move far more historic and memorable than any 15-over-2 upset. Back in the CBS studio, Ernie Johnson, Clark Kellogg, and Charles Barkley are gobsmacked by what’s happening on their monitors. (Please, please let this happen just so we can hear what Barkley has to say.) During commercial breaks, viewers are forced to reckon with all the money flowing into these games—and where that money isn’t flowing. Rather than a B6 story about a 15 beating a 2, the AU–Wisconsin game is A1 news for days. Nobody will care about President Obama’s bracket. Instead, reporters will be lining up to hear his opinion on the NCAA strike. Yeah, none of this is probably going to happen. But this is what March Madness is all about: Before the games begin, anything seems possible.